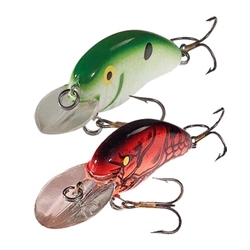 The Bomber Flat A series crankbaits are great when you want a tighter wiggle or more subtle presentation. This crankbait allows you to target specific depths based on your retrieve speed. Suspended fish can be particularly hard-headed and this near-neurtral design gives you the flexibility to target fish at specific depths with specific retrieve speeds. Equally effective fished painstakingly slow or burned for a reaction bite. 2-1/2” length and 3/8oz weight.